Götterdämmerung, or The Twilight of the Gods, see Wagner’s epic Ring Cycle reach its fiery conclusion. Previously, on The Melbourne Ring Cycle, giant Fafner ended up with the Ring in Das Rheingold, humans Siegmund and Sieglinde conceived Siegfried in Die Walküre, and heroic Siegfried slayed Fafner, now a dragon, in Siegfried. Continue reading for a preview of Götterdämmerung, although take heed of this spoiler alert if you will be seeing the opera live at the State Theatre. 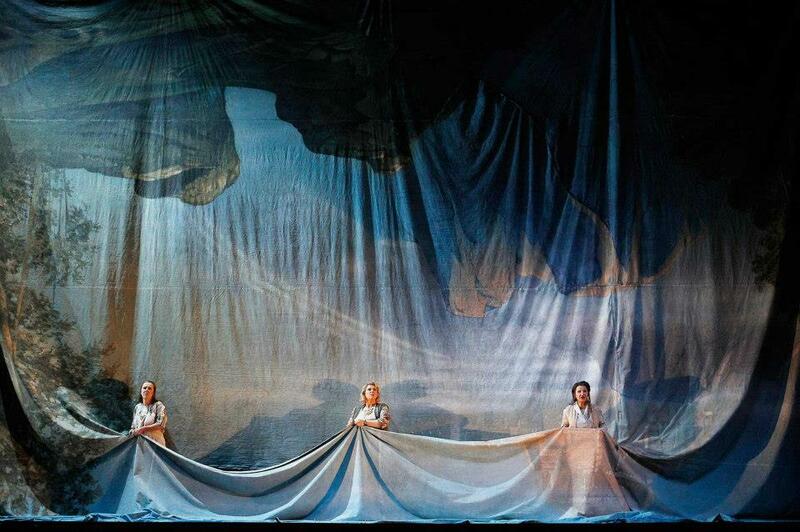 At curtain’s rise, three Norns are sewing the alpine backdrop that the giants tore through in Das Rheingold. They make progress with their repairs, but the backdrops ominously falls at the end of the scene. Brünnhilde and Siegfried have set up a love nest, which consists of a mattress on the floor. In a nice piece of continuity, Siegfried’s blanket from his bunk bed at Mime’s apartment is on the bed. Brünnhilde looks very feminine in silky white negligée and nightgown. Siegfried sets off to do a hero’s deeds of valour. At the end of the prologue, the large chorus of extras creates a festive atmosphere by throwing streamers. 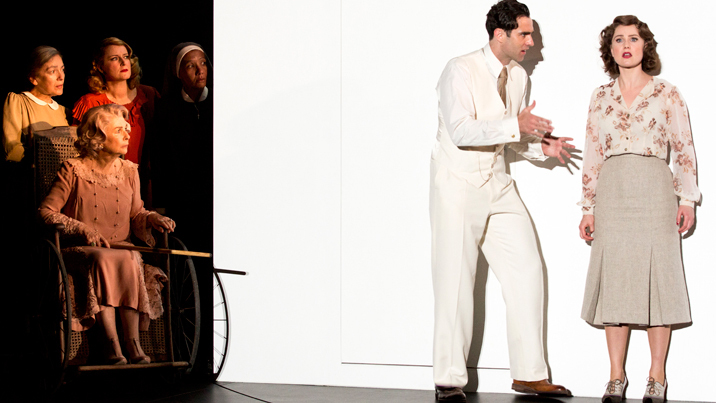 The set revolves, and some couples dance, including, in a modern touch, a pair of men. The castle of the Gibichungs is sparse and modern, set within a series of four barn-shaped frames. Gunther and his sister, the blonde bombshell Gutrune, are dressed in white leisure suits, and are keeping trim using an elliptical trainer and treadmill. Gunther’s half-brother Hagen wants him to marry Brünnhilde and consolidate the family’s power. 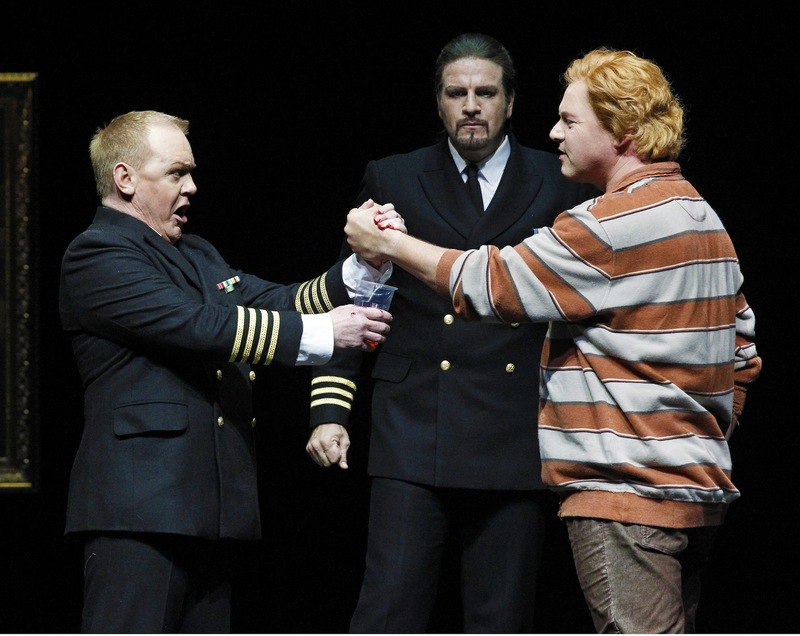 Hagen gives Siegfried a potion that causes him to forget his true love, Brünnhilde. 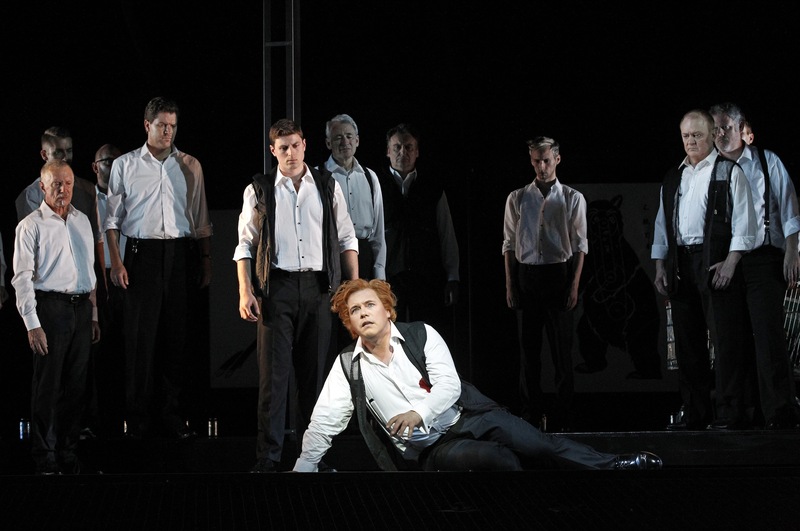 The potion succeeds, and Siegfried sets off to see Brünnhilde, using the Tarnhelm to change his appearance to that of Gunther. Waltraute tells Brünnhilde of the sadness of Wotan’s gradual demise. She pleads with Brünnhilde to return the ring to the Rhein. “Gunther” (Siegfried in disguise) scales the fire around Brünnhilde’s love nest and violently forces the ring from her hand before lying down next to her on the bed. 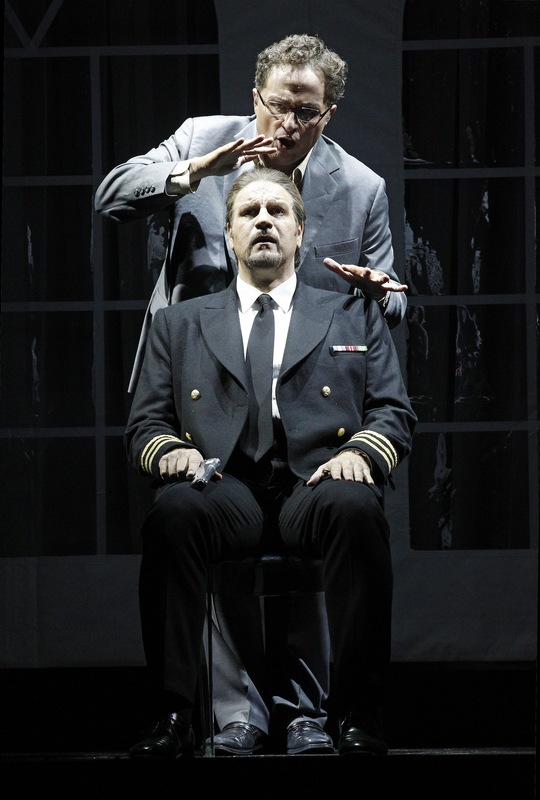 At the start of act two, Alberich appears to his son Hagen in a nightmare, creeping eerily around Hagen, who is asleep in a chair. The barn-like structure is now covered in white canvas to become a marquee. Hagen calls on the men, who are all dressed in black tuxedos and uniforms. The marquee revolves to reveal a full wedding reception, pastel frocks and all. As with Sieglinde’s cabin and Mime’s flat, set decoration is highly detailed, with plenty of glassware and floral centrepieces. In a scene out of The Real Housewives of Gibichung, Brünnhilde is to be wed to Gunther, and Siegfried to Gutrune, who is dolled up as Crystal Barbie with four short-skirted bridesmaids in hot musk pink. 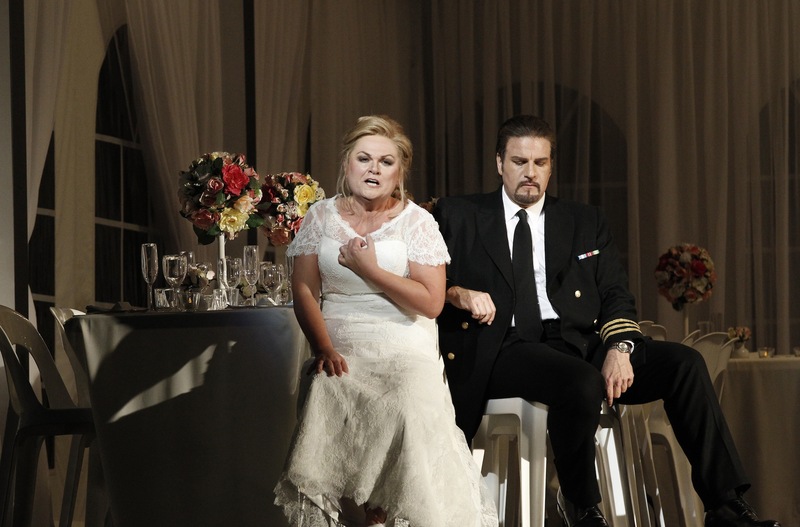 Tears ensue as Brünnhilde tries to comprehend her fate, with further floods when she sees Siegfried with Gutrune. 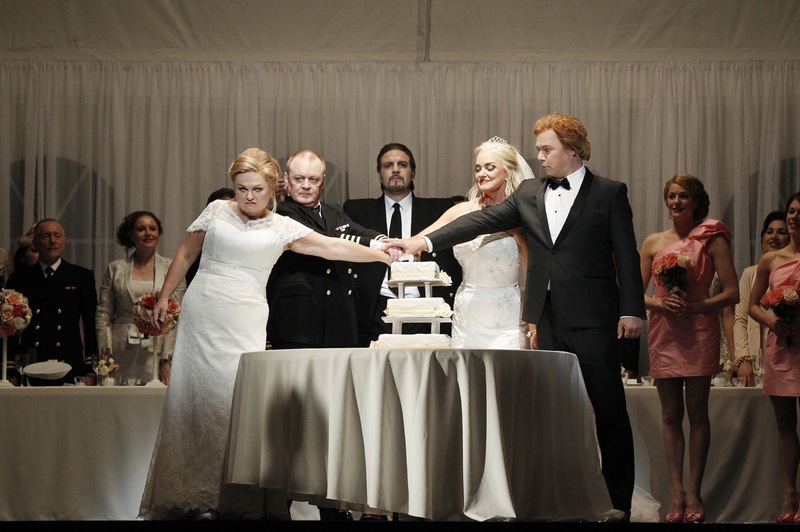 In a rage, Brünnhilde upends a table and scatters the wedding cake. 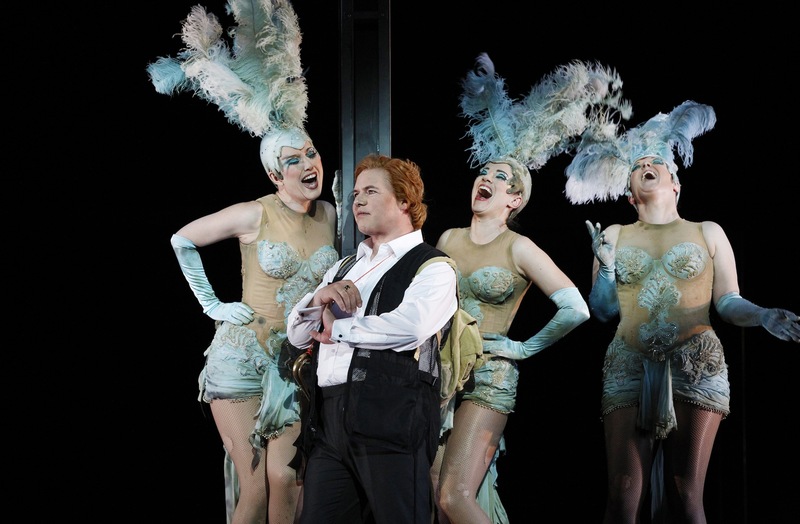 The marquee revolves and all exit, leaving Brünnhilde, the woman scorned, who betrays Siegfried’s secret to Hagen and Gunther by telling them his weak spot (his back). The guests return and end on a picture of the two couples cutting the repaired cake. For the final act, the marquee canvas is gone leaving the bare framework again. The Rhinemaidens enter, looking downcast and worn out, like tired showgirls after performing a show. Siegfried, still naïve, staggers on, trusty horn and rucksack in hand. The maidens plead for their ring but to no avail. Sexually frustrated, Siegfried is about to give himself some relief when the men enter for a shooting party. Three animal targets are flown in, to make the barn structure into a shooting range. The men drink Victoria Bitter from slabs in their Coles shopping trolley. The men wash Siegfried’s hands and feet then paint his face white. He is placed standing in the middle of the stage cloaked in black gauze. Brünnhilde enters numb with grief. 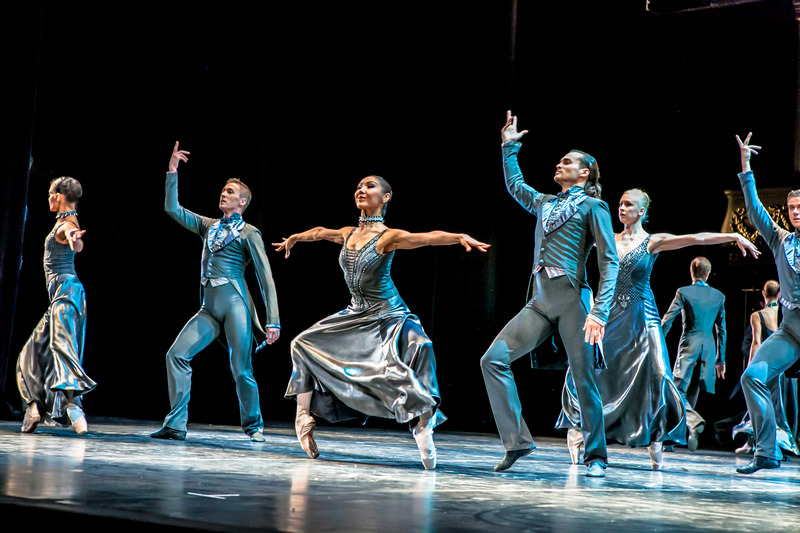 The chorus enter and place bouquets of flowers at Siegfried’s feet. 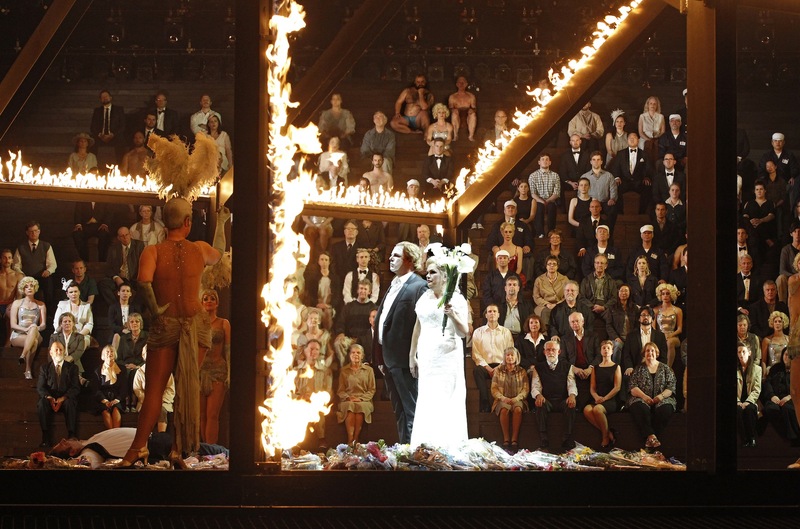 Brünnhilde takes the ring from Siegfried’s hand and gives it to the Rhinemaidens before joining Siegfried on his funeral pyre. The burning of Valhalla is represented by fire over the whole set structure. 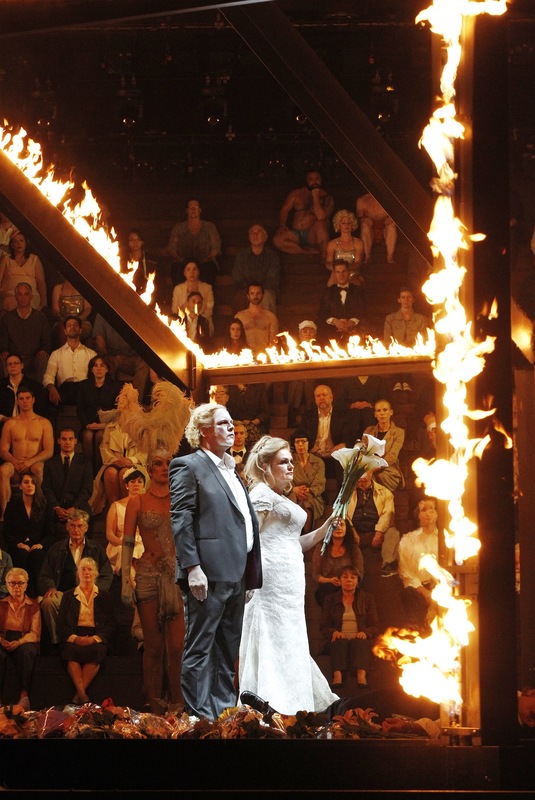 Standing next to Siegfried, Brünnhilde holds lilies that are on fire as the set slowly revolves. The rear curtain lifts to show the entire chorus, extras and dancers watching (sitting on steps to Valhalla) all dressed in various costumes from throughout the Ring Cycle. 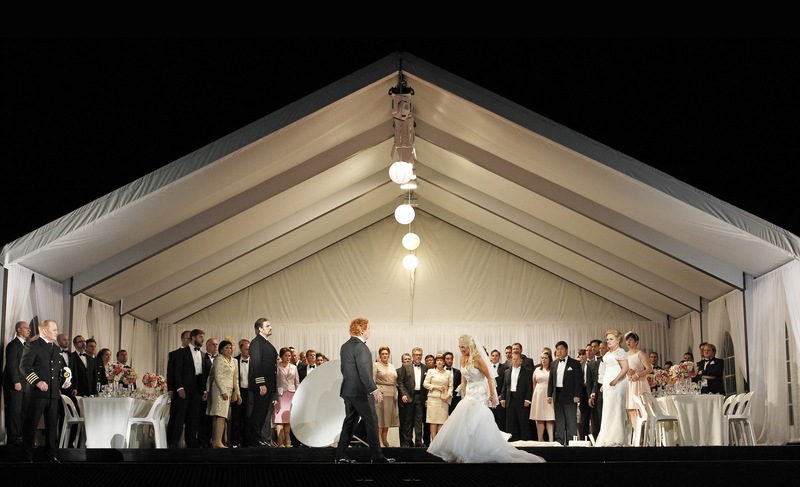 The massive cast are joined onstage for the bows by maestro Pietari Inkinen and the entire Melbourne Ring Orchestra, with the creative team also taking a bow at the end. 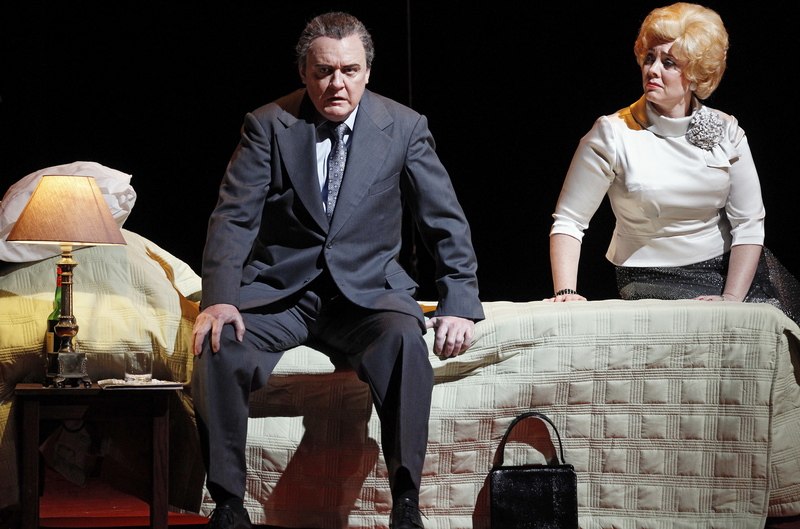 The Melbourne Ring Cycle is playing at State Theatre, Arts Centre Melbourne until 13 December 2013. Götterdämmerung plays 25 November, 4 December and 13 December 2013. Running time is seven hours, including intervals of 90 minutes and 30 minutes. Details about final tickets can be found at the official Melbourne Ring Cycle website. Thanks very much for letting me know about this correction Anna-Lisa, I really appreciate your attention to detail. I have amended the cast list now with the correct artist and character names. I hope that you have had a chance to enjoy the Melbourne Ring Cycle, or are going to see it shortly.